4. What’s the point in a manicure since they only last a day? 8. You now have “at home” clothes and “outside world approved” clothes. If you know people that have seen you in both then they are indeed a true and beloved friend. 10. You can never have too many Goldfish crackers. Ever. This week I was in the mood for a traditional hot ratatouille, but with a nontraditional twist of protein. This Lentil Ratatouille features a creamy braised eggplant and an earthy bite from the lentils. It can be eaten as a hearty stew or served atop any variety of pasta for a delicious dinner entree! In a medium pot, boil 2 cups of water then add the lentils, bay leaves, and thyme. Reduce the heat to a gentle simmer then cook uncovered for 20 – 30 minutes. In large pot, cook olive oil, onion and garlic on medium heat until the onions are translucent. Toss in the eggplant and cook 5-7 minutes, stirring occasionally. Add zucchini and cook with cover on pot for additional 5-7 minutes, stirring occasionally. Add marinara and fresh basil and simmer for an additional 15 minutes, stirring constantly. Remove bay leaves from the lentil mixture, then add the lentils to the ratatouille mixture and serve hot. That looks incredible! 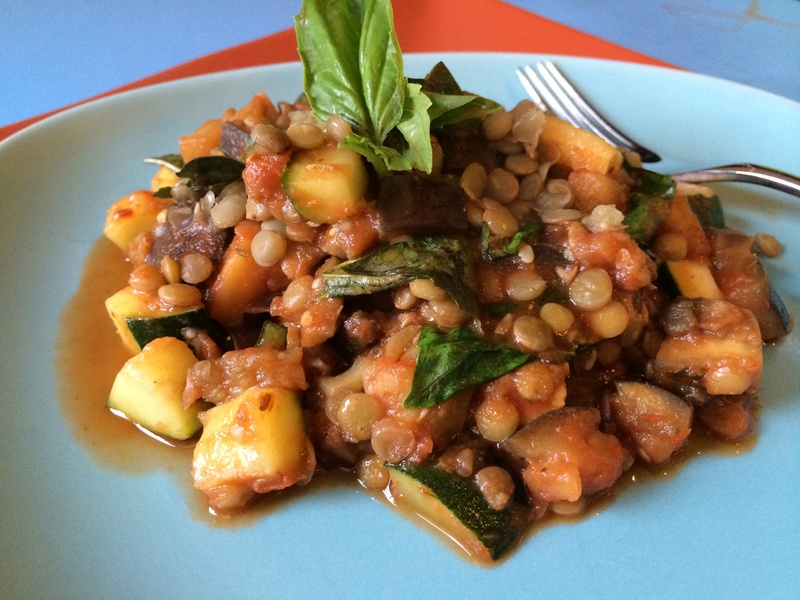 I love lentils and ratatouille – it only makes sense to combine them! It’s a great combo and I’m eating it right now! Love this recipe! I’m making it for the second time for dinner tonight. We are crazy for cheese at our house and topped it with a mild feta-like white cheese – Excellent! Karen that is awesome, so glad you and your family enjoyed it!